Possible closure of a West Sligo-based service. What is wrong when despite the area being represented by four TDs we are now hearing about another potential service loss to Sligo? 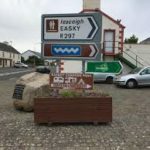 This time it’s the possible closure of the post office in the West Sligo village of Easkey. The service is a substantial and long-standing operation with three postmen also working from the premises. However, it now appears that the office could be facing the chop with effect from next month, March. It’s been said that An Post is looking at the situation and that public submissions are being invited. Easkey’s local garda station was closed and gardai withdrawn in 2013. It was one of 95 shut by the Fine Gael-led government at the time.